Up until we were in the thick of it, we really didn’t know where we wanted to spend the winter traveling. We briefly toured some of the Southeast, but found it to be largely still chilly (we’ve learned a camper will give you thin skin), expensive, and/or crowded with snowbirds, spring breakers, and Mardi Gras goers. We finally reached Texas towards the end of February with Caddo Lake State Park. We initially passed up the opportunity to buy a Texas state parks pass for $70, thinking we wouldn’t use it enough to benefit from it. After stopping at Galveston Island State Park soon after, we reconsidered and made the investment that inadvertently led us on a fairly hearty tour of the Texas parks system over the following several weeks as we awaited more consistently warm weather to reach Utah and other areas we hoped to go. What we found is that Texas has a LOT of state parks and they are all in pretty nice shape despite reports online that some have aging water systems. There is a ton of variety amongst these parks, with some being grander or more interesting than others, but all being at the very least a nice way to spend a day or two. They all charge a several dollar/day/person admission fee even if you are camping there, but our handy parks pass covered all of these costs. Camping rates were usually reasonable ($10-26/night and always with water, electric, and fair to really nice restroom facilities). Our pass also included four 50% off coupons to be used on a second consecutive night of camping in the same park, and we used all of them. Other times, if camping wasn’t offered, we would find day use parking for the trailer, take a nice hike, and camp at a nearby Walmart for a fun and budget-friendly day. Eleven state parks over roughly six weeks was just a sampling of what was out there but we felt it allowed us to see a lot of areas of Texas that we assume mostly only locals (and maybe a few full or part-time RVers) ever get to see. We actually went several hours out of our way to visit the only natural lake in Texas as we had planned to go here before we had the idea to tour a bunch of state parks. Two nights was plenty to check out this unique swampy area. The campground was peaceful and wooded, but the real highlight was renting a canoe to wander amongst the mossy bald cypress trees growing out of the water and watch turtles, bald eagles and egrets in their natural habitat. Even in the gray of winter this atmosphere felt really unique – and less buggy than if it had been green, too. Though not quite as cool as our free site on the beach in nearby Surfside, Texas, the beach side of this park still offered nice views of the Gulf and nearby beach access. 30 minutes from downtown Galveston was a little bit of a hike, but it seems to be the cheapest way to stay on the island. This was one of our quick day trips as the campground didn’t seem too exciting. It seemed to be plenty of time, however, as the park is on the small side. It is a nice place though for short, relaxing hikes and fishing. One of our favorites, Inks Lake would be our go-to relaxing weekend getaway if we were locals. Set on a scenic lake in idyllic Texas Hill Country about an hour from Austin, many sites are on the water and have a lot of space to set out chairs, hammocks, or whatever makes you comfortable. It is a popular spot for fishing and boating, and even has a pretty nice swimming hole. We rented a kayak and were able to paddle right up to our house before enjoying Texas Blue Bell ice cream and a root beer float on the lovely deck behind the general store. The 9 miles of hiking trails were nothing to sneeze at, either. The rockier terrain surrounded by grass, prickly pear cactus, and iconic Texas blue bonnets and Indian paintbrush in full bloom was a beautiful feast for the eyes. Parts of the trails also gained a little in elevation to give aerial views of the lake, while others passed through peaceful wooded areas around the lake. We spent a few days hiking and zen-ing by the water as we watched the ducks and grackles flutter around. Texas bluebonnets are everywhere in spring! Another day trip, we were glad that we were there on a weekday as the day parking areas were not huge. We were able to strategically place ourselves though and took on about eight miles of trail that took us past 60-foot Gorman Falls, to a beautiful overlook of the Colorado River, and over some interesting terrain. Perhaps the greatest name ever for a park, we almost wanted to come here for the name alone. We were lucky to get a site on a weekend, as many of the state parks fill up on most Fridays and Saturdays. With only two miles of trails, we mostly just relaxed by another water view from our site here and watched the boats go by. Not a bad view out our back window! While it was tempting to stay in the campground set amidst a prairie dog town, we wound up just doing a few mile long, somewhat leisurely hikes here. We still of course checked out the prairie dog town though. We could have also played on their 18-hole disc golf course, but the hiking sufficed for us to take in a nice day. Encompassing the historic grounds of Fort Richardson that date back to the Reconstruction Era, this park includes several trails, including an 18-mile out and back multi-use trail that was interesting if for nothing else because it passed quickly between secluded, peaceful terrain, an air strip, and civilization. We completed part of the trail and checked out the remaining original and replica structures from the fort, which contained fairly detailed educational displays of what things were like when it was operational. Oh, and we had this awesome firepit lair to enjoy at our site, too. One of the larger systems of trails in the state parks system, Copper Breaks started to get us into grander scenery as well as more remote areas (the park had plenty of room even on the weekend). The campsites had cool teepee-style picnic overhangs and roadrunners zipped through the sites. We took several hiking loops, most notably “Rocky Ledges”, where we maaay have lost the trail in places we felt could have used clearer markers (we found that starting at the end closer to the parking area would have been much easier). Alas, it made the park that much more memorable as we took in views of the “Copper Breaks” and surrounding panoramas. The night skies were not as dark as we had been hoping with a crescent moon, but they are touted to have some of the best in the area (though nothing beats Big Bend in the lower 48). About two hours from well-known Palo Duro Canyon, Caprock was another one of our favorites. Twenty-plus miles of trails and a five-mile scenic drive take visitors through the canyons, as well as past red rock formations that reminded me slightly of Sedona, AZ. Here, we had the most challenging hike we’d had in a while that took us up on top of the canyons to sweeping panoramic vistas. Buffalo and prairie dogs made this park even better, as we could hear prairie dogs chirping from our campsite and even had to change our route the one day due to a buffalo that seemed just as happy to follow the trail as we were. One of the most well-known natural features of Texas, Palo Duro Canyon was the grandest of all of the state parks. We had a scenic campsite with views of some canyon walls, and checked out a good portion of the few dozen miles of trails it had to offer. The trails were less challenging than Caprock, perhaps due to the popularity of the park, but made up for it in length and views. Our first day of hiking took us past different looking hoodoos, cliffs and boulders at every turn, including a challengingly steep and slippery spur to reach the famous “Lighthouse” formation. Our second day offered beautiful sweeping views down the canyon as we climbed to the top of it. Oh, and in nearby Amarillo, we made sure to stop at an awesome retro RV museum, too. Had we strayed more from our expected route to go into Southern New Mexico or Arizona, we certainly could have found temperate weather similar to what we found throughout Texas. 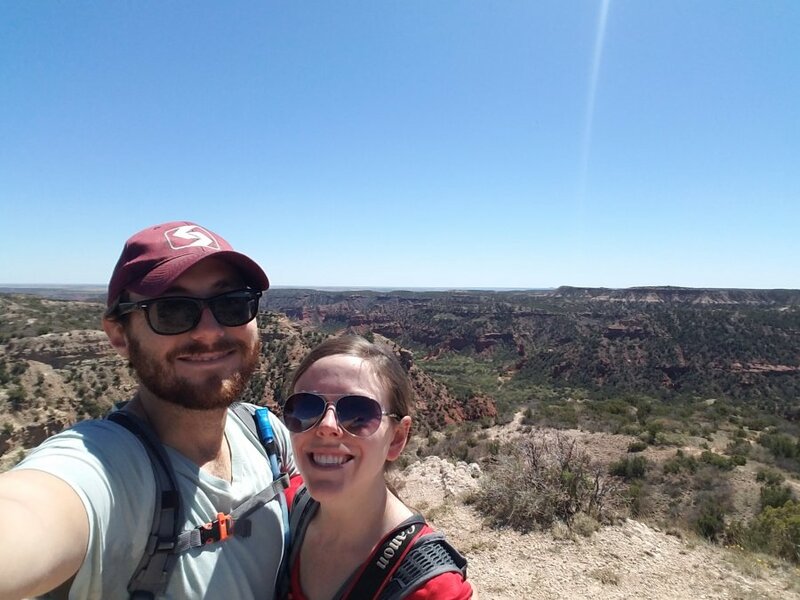 We highly enjoyed our tour of the state parks though, and would definitely recommend some stops (and the parks pass) to anyone looking for some beautiful places from which to get to know Texas a little more personally. Thanks for introducing us to areas in Texas that I have never heard of before. (Most of these for me.) The picture at the head of this article looks like Utah. Such beautiful pictures. Couldn’t see them on my phone like before, but they were so much better on the desktop anyway. Always look forward to your posts.